Rescue Transport – A.A.R.F. – All About Rescue and Fixin' Inc. The A.A.R.F. 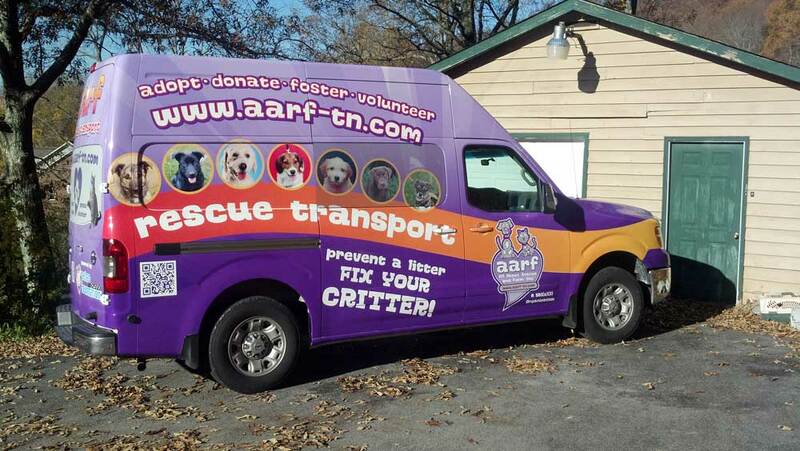 Rescue Transport program was started at the end of 2011 as a result of continuous overcrowding at the animal shelters of the Upper Cumberland, TN region. We realized years ago that we cannot simply rescue our way out of the problem that exists in regard to animal overpopulation in this region. We are too small, and there are too many wonderful animals that continue to be euthanized. As a test to one of the ideas that were brought up at a brainstorming session, volunteers moved into the Cumberland County Animal Shelter in Crossville, TN to see how drastically we could reduce euthanasia by transporting animals to receiving rescues in the Northern US. In the first 6 months of this program, euthanasia of dogs was reduced from 80% to 17%. A.A.R.F. then applied for a grant through the PETCO Foundation, and was granted $45,000 to purchase a transport van, crates, and supplies needed to get this program started. 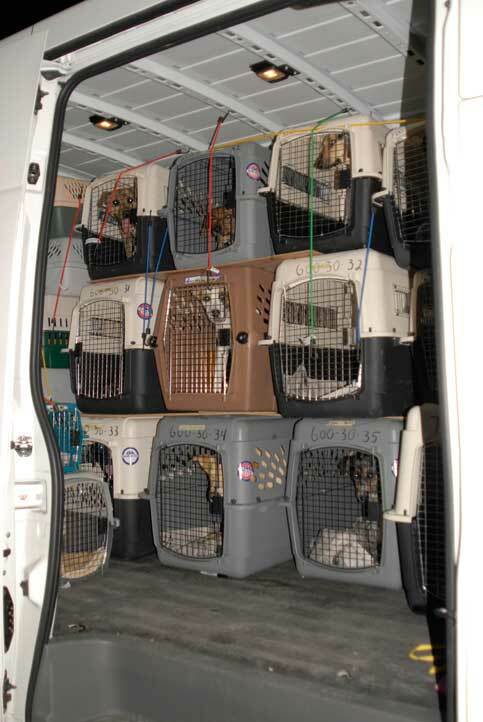 The van was purchased at the end of June 2012 and by the end of 2012, nearly 900 animals were transported in this van from the Upper Cumberland to northern states where shelter dog varieties are typically limited to pit bulls and pit bull mixes. Email blasts are sent to 2500+ northern rescues and shelters when local shelters get in trouble with space. These blasts show all pertinent information about each animal that needs rescuing. Interested rescues reply to these emails stating that they will commit to an individual animal. Then we begin scheduling a transport at that time to the appropriate area. Each inquiring rescue is screened to ensure that they are legitimate, in good standing with the state, and that there are no judgements against them. In addition, each rescue or shelter is visited by a trained volunteer to ensure that each animal is going to a safe place. Also, each partner shelter must absolutely 100% spay neuter every animal prior to adoption. A full load of rescues getting ready to leave. 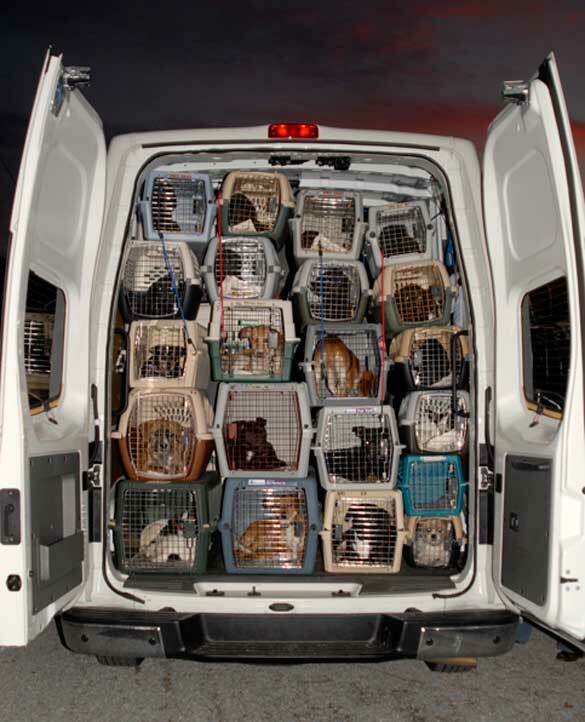 Depending on the size of the animals, the van can transport 25-70 animals at a time. Small dogs, cats, kittens and puppies take up very little crate space – and we have transported 68 on one run previously. Our goal is the fill the van to make each dollar donated stretch. So a run is planned when the van is full. The cost to transport an animal ranges, depending on the number on each run. On average, it costs about $10 per animal per trip. Transports are paid for by donations and grants (when available). Transports are free for receiving rescues. All that receiving rescues are required to pay are for health certificates, rabies vaccines, and any other medical care that they require or request prior to departure. A.A.R.F. only works with local animal shelters that vaccinate all animals on intake and only shelters that communicate openly and honestly about medical and behavioral issues that their animals are experiencing. In addition, these shelter absolutely must spay or neuter all animals prior to adoption. 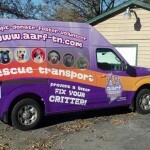 If you are a local shelter and want us to help you save animals from your facility, please contact us at info@aarf-tn.com. If you are a receiving rescue in the north, and are interested in accepting animals, please contact us at info@aarf-tn.com. Already an approved local transport shelter? Complete this form to submit an animal for transport consideration.